All Joshi wrestlers above have profiles on Joshi City, you can click on their names to go straight to it. All matches are shown in full. The event begins with a comedy match featuring one of my favorite wrestlers, Natsumi Maki! Sakura Hirota isn’t necessarily a bad wrestler but she only does comedy these days and her shtick doesn’t really change match to match. It can still be amusing with the right opponent but it can feel a bit repetitive. Natsumi is an entertaining young wrestler from Actwres girl’Z that also wrestles in various other promotions as well. They start with wristlocks, Natsumi flips out of Sakura’s but when Hirota tries to do a handstand she flops to the mat with an injured shoulder. She recovers after a moment, dropkicks by Natsumi and she covers Sakura for two. Sakura comes back with her own dropkicks but has issues knocking Natsumi over, Sakura slaps Natsumi and they discuss things for a bit. Course I can’t understand Japanese so no idea what they are discussing, but the crowd seems to enjoy it. Sakura talks Natsumi into doing a few bumps on her own, but it was all a nefarious trap as she quickly covers Natsumi for a two count. Delayed scoop slam by Sakura, she bounces off the ropes a few times but instead of doing a normal move she screams in Natsumi’s ear. Natsumi cartwheels away from Sakura and hits an armdrag, snapmare by Natsumi and she puts Sakura in a bodyscissors. Natsumi picks up Sakura and dropkicks her in the corner, but Sakura comes back with a face crusher. Wristlock by Sakura and she gets on the top turnbuckle to walk the ropes, but after one successful trick move on the ropes she accidentally crotches herself on them. Natsumi charges Sakura but Sakura drops her into the second rope and pulls on her nose. Snapmare by Sakura, but Natsumi kicks out of the cover. Sakura goes off the ropes and gives Natsumi the Oil Check, dropkick by Natsumi but Sakura hits a second delayed scoop slam. Sakura gets on the second rope but Natsumi recovers and hits a scoop slam. Front flip slam by Natsumi, but Sakura gets a shoulder up. Natsumi gets on the top turnbuckle but Sakura grabs her and puts Natsumi on top of a different turnbuckle instead. Diving crossbody by Natsumi, but Sakura kicks out. Dropkick by Natsumi but Sakura quickly applies La Magistral for two. Natsumi goes for a superkick but Sakura ducks it and kisses her, Natsumi delivers the superkick on the second try but Sakura falls on top of her and gets the three count cover! Sakura Hirota is the winner! I’m not necessarily the target audience for these types of matches, but its always a pleasure to see Natsumi Maki. Some funny bits and fine for a casual watch, but nothing really special or outside of the ordinary. Decent enough for an opener but I wish I could have seen Natsumi in a match that showed off more of her skills. Its LEVEL 5 time! 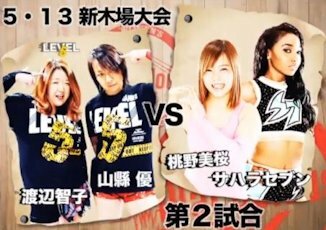 LEVEL 5 is a Marvelous-based faction that includes Tomoko Watanabe, Yuu Yamagata, and Natsumi Maki. Tomoko and Yuu are both long time veterans with many title reigns under their belts, and seem content at the moment to enjoy the twilight of their careers here in Marvelous. Mio Momono is one of the bright young stars of Marvelous and recently changed her attire, showing perhaps that she has grown as a wrestler. She teams with Sahara Seven, an American wrestler on her first tour of Japan. Mio and Yuu kick things off, Mio gets an early advantage before bailing out of the ring when Yuu recovers. Yuu runs out after her and finally catches Mio, she brings Mio back into the ring but Mio greets her with elbows. Yuu pushes Mio into the corner and slaps her hard in the chest, she tags in Tomoko and Tomoko hits a scoop slam. Springboard elbow drop by Tomoko and she follows that with a leg drop for two. Tomoko puts Mio in a camel clutch before letting her go to tag in Yuu, Yuu slaps Mio in the belly but Mio dropkicks her in the leg. A few more dropkicks by Mio and she makes the hot tag to Sahara, Sahara and Yuu trade chops until Sahara rams Yuu’s head into her knees. Mio runs in and dropkicks Yuu, running hip attack by Sahara but Yuu tosses her down and hits a footstomp. She tags Tomoko but Mio re-enters the ring, Mio and Sahara try to kick Tomoko but she doesn’t budge. Mio dropkicks Tomoko off her feet, Sahara drives Tomoko’s head into the mat with her leg, but the cover is broken up. Mio dropkicks Tomoko out of the ring but Tomoko crawls under it to get away from Mio. Mio goes under the ring with her, eventually they both emerge with Tomoko in control. Mio somehow got black marks on her face from being under the mat, which Tomoko proudly shows the crowd until they return to the ring. Lariats by Tomoko, she covers Mio but Mio kicks out. Tomoko picks up Mio but Mio slides away and hits a pair of spinning crossbodies for a two. Mio picks up Tomoko and hits a scoop slam, she goes up top but Yuu kicks Mio in the head. Tomoko grabs Mio but Mio cradles her for a two count. A schoolboy by Mio also gets two as does her next cradle attempt, Sahara comes in but Tomoko hits a springboard move on both of them and tags in Yuu. Yuu elbows Mio in the corner and hits a reverse double knee drop, Mio slides away from Yuu and hits a diving crossbody off the top turnbuckle. She goes back up top but Tomoko grabs her from the apron, Yuu joins Mio but Sahara attacks her from behind. Sahara helps Mio hits a senton, but her cover is broken up. Mio goes off the ropes but Tomoko catches her with a lariat, kick to the head by Yuu but Mio barely kicks out. Yuu goes off the ropes but Mio rolls her up before hitting a footstomp. Another footstomp by Mio and she holds down Yuu, but it only gets two. Mio goes for another cradle but Tomoko comes in to break things up, Sahara holds back Tomoko but lets her go and Mio trips over Tomoko. Yuu quickly grabs Mio and applies a modified cradle, keeping Mio down for the three count! Tomoko Watanabe and Yuu Yamagata are the winners! After the match, Sahara joined LEVEL 5 so I am not sure if they are implying she intentionally let Tomoko go or if it was just a happy coincidence. Anyway, this one had a fair amount of miscommunications or just little blips, nothing major happened but you could tell there were some chemistry issues. Mio’s new gear is solid and she’s a bundle of fun, she still needs some fine-tuning but the potential is there. A decent enough match, nothing offensive but it didn’t click enough for me to recommend you go out of your way to see. Nyla Rose is back! Nyla has always been pushed pretty hard in Marvelous, they like her quite a bit and she has been wrestling off and on in Marvelous since 2016. Chikayo is a long time veteran, she was affiliated with OZ Academy for ten years before becoming a Freelancer in 2015. Even though she is past her prime she still puts on entertaining matches, and Nyla is looking to impress in her first match in Marvelous of the year. They lock-up to start with Nyla pushing Chikayo to the mat, Chikayo avoids Nyla’s boot however and delivers a spinning headscissors. Chikayo jumps on the second turnbuckle to get away from Nyla, but Nyla sits her on the top before press slamming her to the mat for a two count. Nyla picks up Chikayo and press slams her again, Chikayo rolls out of the ring but Nyla goes out after her. Chikayo returns to the ring but Nyla hits an ax handle before delivering a third press slam for a two count cover. Nyla throws Chikayo into the corner and hits a lariat, another lariat by Nyla and she goes up top, but Chikayo recovers and smacks Nyla. Nyla kicks Chikayo back however and hits a diving shoulderblock, Nyla picks up Chikayo but Chikayo slides down her back and applies a waistlock. Nyla elbows out of it but Chikayo applies a hanging armbar over the top rope. Chikayo goes up up but Nyla tosses her down to the mat and hits a body press for two. Nyla goes for a powerbomb but Chikayo reverses it into a facebuster, running kicks by Chikayo and she nails a German suplex hold for a two count. Chikayo goes up top and hits the diving footstomp, but again her cover gets two. Chikayo picks up Nyla but Nyla hits a belly to belly suplex, she puts Chikayo over the top rope and goes up top to deliver a diving knee to Chikayo’s back. Cover by Nyla, but Chikayo kicks out. Nyla quickly applies an armtrap crossface, but Chikayo gets out of the hold. Dragon screw by Chikayo and she applies a figure four leglock, but Nyla grabs the ropes for the break. Nyla catches Chikayo with a backbreaker, she gets on the second turnbuckle but Chikayo joins her and hits a Frankensteiner. They both slowly get up, uranage by Chikayo and she covers Nyla, but Nyla gets a shoulder up. Chikayo goes for a fisherman suplex but Nyla blocks it and hits a series of short-arm lariats. Nyla goes up top but Chikayo avoids the Senton Bomb, now it is Chikayo that goes up but Nyla grabs her from behind and goes for a powerbomb. Chikayo blocks it at first but Nyla delivers the powerbomb anyway, cover by Nyla but Chikayo kicks out at one. Nyla goes for another powerbomb but Chikayo reverses it into a roll-up, she goes off the ropes but Nyla catches her with a superkick. Sit-down powerbomb by Nyla, and she picks up the three count! Nyla Rose wins! Time for the main event, and what an odd on it is. Mostly because Pandita is here, who I am assuming is a guy in a panda suit, but I don’t know their identity. 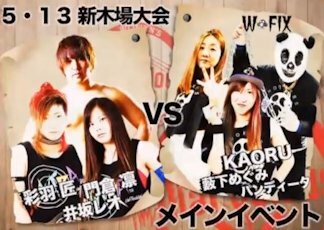 KAORU and Megumi are both part of W-FIX, a heel faction in Marvelous that also includes Chikayo Nagashima. The other team contains the top young wrestlers in Marvelous, with the tag team NEW-TRA (Rin Kadokura and Takumi Iroha) teaming with the young Leo Isaka. An interesting main event to be sure. They start brawling as the bell rings and all six wrestlers end up out on the floor. They battle around the stands until Megumi and kkk return to the ring with Leo as he gets triple teamed near the ropes. Megumi stays in with Leo and whips him in the chest before tagging in Pandita, headlock by Pandita and he lets go to tag in KAORU. KAORU works over Leo’s arm until Takumi breaks things up, KAORU grabs Leo and makes the tag to Pandita. Enzuigiri by Leo and he hits a running elbow smash, giving him time to tag in Rin. Rin and Leo double team Pandita, Rin picks up Pandita and she drops him with a DDT. Lariat by Rin, and she covers Pandita for two. Rin throws Pandita into the corner but Pandita avoids her charge and grabs Rin’s wrist before walking the ropes. Pandita jumps off and clubs on Rin’s arm and tags in Megumi, Megumi whips Rin but Rin dropkicks Megumi in the leg. Another dropkick by Rin and she delivers a third, Rin picks up Megumi and drops her with a scoop slam for a two count. Rin picks up Megumi but Megumi grabs her arm and applies a hanging armbar over the top rope. She lets go after a moment, Rin escapes and she makes the tag to Leo. Elbow by Leo to Megumi and he hits a slingshot senton, but Megumi gets her foot on the ropes to break up the pin. Leo goes for a chokeslam but Megumi reverses it into a cross armbreaker, she tags in KAORU and KAORU hits Leo repeatedly with a board. Vertical suplex by KAORU to Leo, but the referee won’t count since KAORU used a weapon. Back up they trade strikes until KAORU hits a hurricanrana, she goes back to her board and cracks Leo in the head with it. KAORU goes up top but Takumi kicks her from the apron to knock her back down, running Shooting Star Press by Leo and he makes the tag to Takumi. Kick by Takumi and she knocks over KAORU with a sliding kick, Takumi picks up KAORU and she hits a snap vertical suplex. Rin comes in but KAORU flips away from them and with Megumi they both hit boots to their opponents. Nagashima comes in with a belt and they choke Takumi while KAORU hits her in the head with the board. Brainbuster by KAORU to Takumi, but she barely gets a shoulder up. Megumi comes in as does Pandita as they all attack Takumi in the corner, but Takumi knocks over KAORU with a heel kick. KAORU bridges out of the pin but Takumi hits a powerbomb, Takumi picks up KAORU and nails the Last Ride Powerbomb, but Megumi breaks up the pin. Rin goes up top and hits a missile dropkick before Takumi hits a release German, but KAORU lands in her corner and Pandita tags himself in. Pandita lariats Takumi and drops her with a backdrop suplex, but Rin breaks up the cover. Leo comes in to help and ends up sailing out of the ring onto KAORU and Megumi with a somersault plancha, back in the ring Rin hits a tornado DDT onto Pandita before Pandita eats a triple superkick. Takumi goes up top and delivers the Frog Splash, but the referee is pulled out of the ring as she makes the count. Takumi drops Pandita with a high kick, KAORU comes in to try to hit Takumi with the board but she hits Pandita by accident. Takumi goes back up top and nails the Swanton Bomb, and she picks up the three count! Your winners are Rin Kadokura, Takumi Iroha, and Leo Isaka. Marvelous is a fun promotion to watch and they have some bright young stars. As a complete show, this event is a bit lacking in overall content with only four matches that clocked well under an hour total. So they aren’t on the quality-level of a complete show from Sendai Girls’ or Stardom, but they still hold a special place in my heart as I really enjoy Natsumi, Takumi, Rin, and Mio. No MOTYC here, but perfectly fine for a casual watch.